Michel de Montaigne invented the literary term “essay” derived from the French word essai, meaning to put on trial. In his collection of essays he describes his life’s work in testing his responses to different subjects and situations, using his ego and alter ego as council for and against the case. In one such essay he writes, “Why do doctors begin by practising on the credulity of their patients with so many false promises of a cure, if not to call the powers of the imagination to the aid of their fraudulent concoctions?” It is hard to believe that this was written over 400 years ago, yet this book of essays in the style invented by Montaigne, is still addressing the same follies ascribed to 16th Century French citizens. In 1764 Voltaire published his Dictionnaire philosophique in which he took the essay format one step further by adding his sardonic wit, to better illuminate the follies and fallacies of that époque. One of his aphorisms that resonates 250 years on, went like this: “Faith consists in believing when it is beyond the power of reason to believe. It is not enough that a thing be possible for it to be believed”. Thomas Browne, an English essayist of the same period attempted to understand the follies of mankind and their capacity of making “vulgar errors” in observation and belief. One was entitled “That a man hath one Rib less than a woman”. Christian orthodoxy of the day taught a fundamentalist interpretation of the Bible. It therefore followed that if Eve were fashioned from Adam’s rib, then Eve’s descendents would always have one more rib than Adam’s descendents. Browne doubted that and went to study anatomy in the Low Countries and made his business to count the number of ribs on both sides of the chest in male and female cadavers. 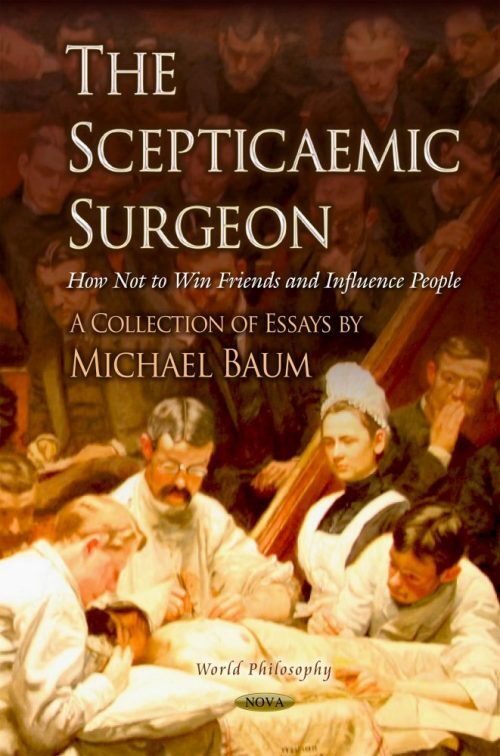 In this collection of essays Michael Baum follows in the footsteps of these giants of the Enlightenment a provides with a selection of his essays written over a period of more than 20 years where he challenges much of the received wisdom of the current era. Building on a foundation of scientific and moral philosophy he then carries out a hatchet job on the proponents of quackery. His scepticism then carries over in attacks on the closed minds of those who inhibit innovation and those who are stuck in the time warp of the uncritical acceptance of screening for cancer. Throughout this book it can be seen that he is guided by the teachings of medical humanities. In 1989 Dr.Petr Skrabanek published a book entitled “Follies and Fallacies in Medicine” continuing the tradition of the age of enlightenment where, for the first time, the pathological state of scepticaemia is defined as follows. Scepticaemia: An uncommon generalized disorder of low infectivity. Medical school education is likely to confer life-long immunity. Chapter 9. Evidence Based Art? Chapter 16. Can We Sustain an Open-Minded Approach to Homeopathy? Chapter 17. Homeopathy Waives the Rules-OK? Chapter 18. Magic Mushrooms and Bent Spoons: That Was the Week That Was! Chapter 22. What Are the Needs of Patients Diagnosed with Cancer? A Cancer Therapy: results of fifty cases and the cure of advanced cancer by diet therapy, Max Gerson, Gerson Institute Bonita, California, 1986. Voodoo Science, Robert Park, Oxford University Press, Oxford, 2000. ‘Sudden fall in breast cancer death rates in England & Wales’, Beral V, Hermon C, Reeves G, Peto R,. Lancet 1995; 345:1642-3. Benson Hugh H. 2000, Socratic Wisdom: The Model of Knowledge in Plato's Early Dialogues, New York: Oxford University Press. Mathers N. and Hodgkin P. The Gatekeeper and the Wizard: a fairy tale. BMJ 1989;298(6667): 172-4. GRIT Study Group. A randomised trial of timed delivery for the compromised preterm fetus: short term outcomes and Bayesian interpretation. BJOG. 2003 Jan;110(1):27-32. Fisher B, Jeong J-H, Anderson S, Bryant J, Fisher ER, Wolmark N. Twenty five-year follow-up of a randomized trial comparing radical mastectomy, total mastectomy,and total mastectomy followed by irradiation. N Engl J Med 2002;347:567-75. Definition of ‘Induction’, Cambridge Dictionary of Philosophy, 2nd Edition, General Editor Robert Audi, Cambridge, 1999. Popper KR; The Logic of Scientific Discovery, Routledge Classics, 2002, p255. Popper KR. The open society and its enemies, volume 2. Hegel & Marx, Routledge, London, 1992. Berwick D. “We all have AIDS”: case for reducing the cost of HIV drugs to zero. BMJ 324; 214-216: 2002. News ; BMJ 324;187: 2002. Beauchamp TL., The four- principles approach. In; Principles of health care ethics, Editor Raanan Gillon, John Wiley and Sons, Chichester.New York. Brisbane. Toronto, Singapore. 1994 pp 3-12. Moynihan R. Surrogates under scrutiny. BMJ 2011, 343:399-401. Montazeri A. Health-related quality of life in breast cancer patients: a bibliographic review of the literature from 1974 to 2007. J Exp Clin Cancer Res. 2008 Aug 29;27:32. Dhillon PK, Yeole BB, Dikshit R, Kurkure AP, Bray F. Trends in breast, ovarian and cervical cancer incidence in Mumbai, India over a 30-year period, 1976-2005: an age-period-cohort analysis. Br J Cancer. 2011.301: 1038. Autier P, Boniol M, Gavin A, Vatten LJ, Breast cancer mortality in neighbouring European countries with different levels of screening but similar access to treatment: trend analysis of WHO mortality database. BMJ, 2011, 343:300. Jørgensen KJ, Gøtzsche PC. Overdiagnosis in publicly organised mammography screening programmes: systematic review of incidence trends. BMJ 2009;338-341. Welch GH, Black WC. Over-diagnosis in cancer. J Natl Cancer Inst. 2010;102:605-13. Welch, HG, Screening mammography - A long run for a short slide? N Engl J Med. 2010;363:13. US Preventive Services Task Force. Screening for breast cancer: recommendation statement. Ann Int Med 2009;151:716-26. Gøtzsche PC, Nielsen M. Screening for breast cancer with mammography. Cochrane Database Syst Rev 2009;4:CD001877. Baum M. Biological considerations in the management of early carcinoma of the breast and their role in the selection of therapy. Ann Roy Col Surg Engl 1980;62:35-38. Fisher B, Anderson S, Bryant J, et al. Twenty-year follow-up of a randomized trial comparing total mastectomy, lumpectomy, and lumpectomy plus irradiation for the treatment of invasive breast cancer. N Engl J Med 2002;347:1233-41. Early Breast Cancer Trialists' Collaborative Group (EBCTCG). Effects of chemotherapy and hormonal therapy for early breast cancer on recurrence and 15 year survival: an overview of the randomised trials. Lancet 2005; 365: 1687-1717. Jones A, Ellis P. Potential withdrawal of bevacizumab for the treatment of breast cancer ,BMJ 2011;343:1136. Nielsen M, Thomsen JL, Primdahl S, Dyreborg U, Andersen JA: Breast cancer and atypia among young and middle-aged women: a study of 110 medicolegal autopsies. Br J Cancer 56:814-819, 1987. Holland R, Veling SH, Mravunac M, Hendriks JH: Histologic multifocality of Tis, T1-2 breast carcinomas. Implications for clinical trials of breast-conserving surgery. Cancer 56:979-990, 1985. Vaidya JS, Vyas JJ, Mittra I, Chinoy RF: Multicentricity and its influence on conservative breast cancer treatment strategy. Hongkong International Cancer Congress: Abstract 44.4, 1995. Baum M, Vaidya JS, Mittra I: Multicentricity and recurrence of breast cancer [letter; comment]. Lancet 349:208, 1997. Vaidya JS, Baum M, Tobias JS, D'Souza DP, Naidu SV, Morgan S, Metaxas M, Harte KJ, Sliski AP, Thomson E: Targeted intra-operative radiotherapy (Targit): an innovative method of treatment for early breast cancer. Ann Oncol 12:1075-1080, 2001. Vaidya JS, Baum M, Tobias JS, Morgan S, D'Souza D: The novel technique of delivering targeted intraoperative radiotherapy (Targit) for early breast cancer. Eur J Surg Oncol 28:447-454, 2000. Vaidya JS, Joseph DJ, et al. : Targeted intraoperative radiotherapy versus whole breast radiotherapy for breast cancer (TARGIT-A trial): an international, prospective, randomised, non-inferiority phase 3 trial. Lancet 2010; 376; 91-102. Goldhirsch A, Wood WC, et al. : Strategies for subtypes – dealing with the diversity of breast cancer: highlights of the St Gallen International Expert Consensus on the Primary Therapy of Early Breast Cancer 2011. Annals of Oncology Advance Access; 2011. Biopsy specimens should be legally defined as donations, Wright PK, BMJ 2004, 328;642. Not a slippery slope or sudden subversion: German medicine and National Socialism in 1933 Hanauske-Abel, H.M. Brit.Med.J. 1996;313:1453-1463. Humanities in Medicine Beyond the Millenium, Ed. Robin Philipp,Michael Baum,Andrew Mawson and Sir Kenneth Calman Nuffield Trust Series No.10 ,London 1998. The Two Cultures and the Scientific Revolution, The Rede Lecture 1959, Cambridge University Press. The Quest for pure truth. Melvyn Bragg; Independent on Sunday 8th March 1998. Why Arts courses for medical curricula? Calman K. and Downie R. Lancet 1996; 347: 1499-1500. The Logic of Scientific discovery, Popper K. R. Hutchinson: London 1968. The Structure of Scientific Revolutions, T.S. Kuhn, Chicago; University of Chicago Press, 1970. Zen and the Art of Motorcycle maintenance , Robert M. Pirsig, Bantam Books , Toronto/New York/ London , 15th printing 1976. Janus: a summing up, Arthur Koestler, Picador London , 1979. Quack cancer cures or scientific remedies, Baum M. J. R. Soc Med 1996;89:543-547. Principles of Biomedical ethics, 3rd edition 1989. Beauchamp T and Childress J, Oxford University Press, New York, Oxford. Religion, spirituality, and medicine Sloan RP , Bagiella E , Powell T, The Lancet 1999;353: 664-667. The greatest benefit to mankind, Roy Porter , Harper Collins London, 1997. Why Literature and Medicine? McLellan M F and Hudson Jones A. The Lancet 1996 ;348: 109-111. Love’s Work, Gillian Rose, Schocken Books, New York 1996. A manifesto for reading medicine Horton R. The Lancet 1997; 349:872-874. The Arts of healing Friedrich, M. J. Journal of the American Medical Association 1999: 281: 1770-1781. Literature and medicine: the patient, the physician, and the poem. McLellan MF. The Lancet 1996;348: 1640-1641. How Renoir coped with rheumatoid arthritis. Boonen A ,van de Rest J, Dequeker J ,van der Linden S. The Lancet 1997 ; 315:1704-1708. The magic mountain. Thomas Mann, First published 1924, Recent English translation by H.T. Lowe-Porter, Vintage, London 1999. Creativity and disease, Philip Sandblom George F. Stickley and Co. Philadelphia, 4th edition 1987. The man who mistook his wife for a hat. Oliver Sacks, Picador London 1986. Music and Medicine, Anton Neumayr Medi-Ed press; Bloomington, Illinois, 1995. General Medical Council education committee. Tomorrow’s doctors: GMC, 1993. Narrative based medicine; Why study Narrative? Trisha Greenalgh and Brian Hurwitz, Brit Med J ;318: 48-50, 2000. Teaching the humanities to medical students, Baum M, Clinical Medicine, 2002, 2; 246 -249. Evidence-based art? Baum M, J R. Soc Med 2001 94: 306-307. Monitoring the education revolution: The impact of new training programmes must be evaluated. Wass V, Richards T, Cantillon P, BMJ, 2003, 327;1362. Browning R. Justinian and Theodora. London: Thames and Hudson, 1987: 165±178. 1999 Blackwell Science Ltd.
	Mantellou P. The personal life of Theodora before her marriage with Justinian, according to Procopius’ Anecdota. Byzantine Studies 1990; 2: 330±339. Mommsen T, ed. Victoris Tonnennensis episcopi Chronica. In: Monumenta Germaniae Historica, Vol. II. Berolini: Weidmann, 1894: 202. Zervos S, ed. Aetii Sermo Sextidecimus et Ultimus. Leipzig: A Mangkos, 1901: 60±68. Baum M, Cassileth BR, Daniel R, Ernst E, Filshie J, Nagel GA, Horneber M, Kohn M, Lejeune S, Maher J, Terje R, Smith WB. The role of complementary and alternative medicine in the management of early breast cancer: recommendations of the European Society of Mastology (EUSOMA). Eur J Cancer. 2006 Aug;42(12):1711-4. Baum M, Concepts of holism in orthodox and alternative medicine. Clinical Medicine 2010, 10; 37-40. Baum M, An Open Letter to HRH The Prince of Wales: With respect your Highness you’ve got it wrong. BMJ 2004; 329: 118. Calman, K and Downie, R. Why arts courses for medical curricula? Lancet, 1996; 347 : 1499 – 1500. Koestler, A. Janus: A summing up. Picador, London 1978. Fallowfield, L.J., Baum, M. Maguire G,P. Addressing the psychological needs of the conservatively treated breast cancer patient. J.Roy.Soc.Med. 80 (11): 646-700, 1987. Baum M, Pre-implantation genetic diagnosis (PGD): The spectre of eugenics or a ‘‘no brainer’’, International Journal of Surgery (2006) , 144145. Baum M, Ernst E, Lejeune S, Horneber M. The role of complementary and alternative medicine (CAM) in the care of patients with breast cancer. European J Cancer (in press 2006). Ebbs SR, Fallowfield LJ, Fraser SC, Baum M.
Treatment outcomes and quality of life. Int J Technol Assess Health Care. 1989;5(3):391-400. Ernst E. A systematic review of systematic reviews of homeopathy.Br J Clin Pharmacol 2002;54:577-582. Shang A, Huwiler-Müntener K, Nartey L, et al. Are the clinical effects of homoeopathy placebo effects? Comparative study of placebo-controlled trials of homoeopathy and allopathy. Lancet 2005; 366: 726-732. The Lancet. The end of homoeopathy. Lancet 2005; 366: 690. Dominic Lawson Can you tell the difference between homeopaths and witch doctors? The Independent, Friday 26 May, 2006, 35. Holmes, O. W. (1892) The Autocrat of the Breakfast Table ,40 Houghton Mifflin Boston. Linde K, Clausius N, Ramirez G, Melchart D, Eitel F, Hedges LV et al. Are the clinical effects of homoeopathy placebo effects? A meta-analysis of placebo-controlled trials. Lancet 1997;350:834-43. Ernst E, Pittler MH, Stevinson C, White AR. The desktop guide to complementary and alternative medicine. Edinburgh: Mosby. 2001. Shang A, Huwiler-Muntener K, Nartey L, Juni P, Dorig S, Sterne JA et al. Are the clinical effects of homoeopathy placebo effects? Comparative study of placebo-controlled trials of homoeopathy and allopathy. Lancet 2005;366:726-32. Ernst E, Pittler MH, Wider B, Boddy K. The desktop guide to complementary and alternative medicine. 2nd edition. Edinburgh: Mosby/Elsevier. 2006. Yamamoto S, Sobue T, Kobayashi M, Sasaki S, Tsugane S; Japan Public Health Center-Based Prospective Study on Cancer and Cardiovascular Diseases Group. Soy, isoflavones, and breast cancer risk in Japan. J Natl Cancer Inst 2003;95:906–13. Nishio K, Niwa Y, Toyoshima H, Tamakoshi K, Kondo T, Yatsuya H, Yamamoto A, Suzuki S, Tokudome S, Lin Y, Wakai K, Hamajima N, Tamakoshi A. Consumption of soy foods and the risk of breast cancer: findings from the Japan Collaborative Cohort (JACC) Study. Cancer Causes Control. 2007 Oct;18(8):801-8. Khaw KT, Wareham N, Bingham S, Welch A, Luben R, Day N Combined Impact of Health Behaviours and Mortality in Men and Women: The EPIC-Norfolk Prospective Population Study. PLoS Med. 2008 Jan 8;5(1):e12 [Epub ahead of print]	Screening Evidence and Practice. Angela Raffle and Muir Gray, Oxford University Press, Oxford 2007. Fidan D, Unal B, Critchley J, Capewell S. Economic analysis of treatments reducing coronary heart disease mortality in England and Wales, 2000-2010.QJM. 2007 May;100(5):277-89. Baum M A lifetime in breast cancer research. Eur J Cancer. 2007 Jul;43(10):1496-7. Cuzick J, Baum M. Tamoxifen and contralateral breast cancer. Lancet 1985;ii:282. Cuzick, J., Forbes, J., Edwards, R., Baum, M., Cawthorn, S., Coates, A., et al., First results from the International Breast Cancer Intervention Study (IBIS-I): a randomised prevention trial. Lancet, 2002. 360(9336): p. 817-24. Howell, A., Cuzick, J., Baum, M., et al., Results of the ATAC (Arimidex, Tamoxifen, Alone or in Combination) trial after completion of 5 years' adjuvant treatment for breast cancer. Lancet, 2005. 365(9453): p. 60-2. Black W.C., Nease R.F. Jr., Tosteson A.N. Perceptions of breast cancer risk and screening effectiveness in women younger than 50 years of age. Journal of the National Cancer Institute 1995;87:720-731. Blanks RG, Moss SM, McGahan CE, Quinn MJ, Babb PJ. Effect of NHS breast screening programme on mortality from breast cancer in England and Wales, 1990-8: Comparison of observed with predicted mortality. BMJ 2000; 321:665-9. NHS cancer screening programmes. NHS Breast Screening Programme & British Association of Surgical Oncology Breast Group. An audit of screen detected breast cancers for the year of screening April 1999 to March 2000.16-5-2001. Collins LC, Tamimi RM, Baer HJ, Connolly JL, Colditz GA, Schnitt SJ Cancer. Outcome of patients with ductal carcinoma in situ untreated after diagnostic biopsy. Cancer 2005 May 1;103(9):1778-84. Zackrisson S, Andersson I, Manjer J and Garne JP, Rate of over-diagnosis of breast cancer 15 years after end of Malmö mammographic screening trial: follow up study. BMJ 2006;332:689-92. Møller H, Davies E, Over-diagnosis in breast cancer screening. BMJ 2006; 332: 691-692. Miller AB. The costs and benefits of breast cancer screening. Am J Prev Med 1993;9:175-80. Sarfati D. Howden-Chapman P. Woodward A. Salmond C. Does the frame affect the picture? A study into how attitudes to screening for cancer care are affected by the way benefits are expressed. Journal of Medical Screening 1998; 5(3):137-140. Vervoort MM, Draisma G, Frachebaud J, van de Poll-Franse, de koning HJ (2004). Trends in the usage of adjuvant systemic therapy for breast cancer in the Netherlands and its effect on mortality. Br J Cancer 91: 241-247. Watmough D.J. Interval Breast Cancers. American J Roentgenology July 1993, 161, 3. H.Gilbert Welch, “Should I be tested for Cancer?” University of California Press, 2004, ISBN 0520239768. Moss SM, Cuckle H, Evans A, Johns L, Waller M, Bobrow L, for the Trial Management Group. Effect of mammographic screening from age 40 years on breast cancer mortality at 10 years' follow-up: a randomised controlled trial. Lancet 2006;368:2053-60. Ian Stewart, Life’s other secret: the new mathematics of the living world. Allen Lane The Penguin Press, London, 1998. Braithwaite PA and Shugg D, Rembrandt’s Bathsheba: the dark shadow of the left breast. Annals of the Royal College of Surgeons. 1983;65: 337-339. Gross SW, A practical treatise of tumours of the mammary gland. D. Appelton & Co New York, 1880. Greenwood M, A report on the natural duration of cancer: reports on public health and medical subjects, No. 33 H.M.S.O. London, 1926. Daland EM, Untreated Carcinoma of the Breast. Surgery, Gynaecology and Obstetrics, 1927; 44: 264-271. Bloom HJG, Survival of women with untreated breast cancer-Past and present. In, Prognostic Factors in breast Cancer, Eds. APM Forrest and PB Kunkler, E&S Livingston Ltd. Edinburgh, 1968. MacKay EN and Sellers AH, Breast cancer at the Ontario Cancer Clinics, 1938-56, A statistical review. Medical statistics branch, Ontario department of health. 1965. Steckler RM and Martin RG, Prolonged survival in untreated breast cancer. The American J Surgery 1973;126: 111-119. Halsted WS. The results of operations for the cure of cancer of the breast performed at The Johns Hopkins Hospital from June 1889 to January1894. Johns Hopkins Hosp Rep 1894; 4: 297–350. DeMoulin D, A short history of Cancer. Martinus Nyhoff Publishers, Boston, The Hague, Lancaster. 1983. Virchow R. 1863-1873 Die Krankhaften Geschwulste, Hirshwald Publishers, Berlin. Vol 1. Lewis D, Rienhoff WFJ. A study of results of operations for the cure of cancer of the breast. Ann Surg 1932;95: 336. Halsted WS The training of the Surgeon. In surgical papers by William Stewart Halsted, Vol. 2. The Johns Hopkins Press; Baltimore, 1924. Urban J. Management of operable breast cancer: the surgeon’s view. Cancer 1978; 42: 2066. Meier P, Ferguson DJ, Karrison T. A controlled trial of extended radical mastectomy. Cancer 1985; 55: 880–91. Lacour J, Le M, Caceres E, Koszarowski T, Veronesi U, Hill C. Radical mastectomy versus radical mastectomy plus internal mammary dissection. Ten year results of an international cooperative trial in breast cancer. Cancer 1983; 51: 1941–3. Brinkley D and Haybittle JL. A 15 year follow up study of patients treated for carcinoma of the breast. British J Radiology, 1968;41:215-221 Brinkley D and Haybittle JL. The curability of breast cancer. The Lancet 1975;2:9-14. Fisher B. Laboratory and clinical research in breast cancer: a personal adventure: the David A. Karnofsky memorial lecture. Cancer Res 1980;40: 3863–74. Early Breast Cancer Trialists’ Collaborative Group. Systemic treatment of early breast cancer by hormonal, cytotoxic or immune therapy: 133 randomized trials involving 31,000 recurrences and 24,000 deaths among 75,000 women. Lancet 1992;339:1-15,71-85. Early Breast Cancer Trialists’ Collaborative Group. Effects of radiotherapy and surgery in early breast cancer. An overview of randomized trials. N Engl J Med 1995; 333:1444–5. Nystrom L, Andersson I, Bjurstam L, et al, Long term effects of mammographic screening: updated overview of the Swedish randomized trials. Lancet; 2002;359:909-919. Overgaard M, Hansen PS, Overgaard J et al. Postoperative radiotherapy in high-risk premenopausal women with breast cancer who receive adjuvant chemotherapy. Danish Breast Cancer Cooperative Group 82b Trial N Engl J Med 1997;337: 949–55. Ragaz J, Jackson SM, Le N et al .Adjuvant radiotherapy and chemotherapy in node-positive premenopausal women with breast cancer. N Engl J Med 1997; 337: 956–62. Skipper HE. Kinetics of mammary tumor cell growth and implications for therapy. Cancer 1971; 28: 1479–99. Frei E III, Teicher B, Holden SA, Cathart KNS, Wang Y. Preclinical studies and clinical correlation of the effect of alkylating dose. Cancer Res 1988; 48: 6417–23. Frei E III, Antman K, Teicher B, Eder P, Schnipper L. Bone marrow autotransplantation for solid tumours—prospects. J Clin Oncol 1989; 7: 515–26. Coleman RE, Rubens RD, Fogelman I. Reappraisal of the baseline bone scan in breast cancer. J Nucl Med 1988; 29: 1045–9. Baum M, Badwe RA. Does surgery influence the natural history of breast cancer? In: Wise H, Johnson HJ, eds. Breast Cancer: Controversies in Management. Armonk, NY: Futura, 1994: 61–9. Schipper H, Turley EA, Baum M. A new biological framework for cancer research. Lancet 1996; 348: 1149–51. Schipper H. Historic milestones in cancer biology: a few that are important in cancer treatment. Semin Oncol 1979;6: 506–14. Baum M, Vaidya JS, Mittra I. Multicentricity and recurrence of breast cancer. Lancet 1997; 349: 208. Whitmore WFJ. The natural history of prostate cancer. Cancer 1973; 32: 1104–12. Demicheli R, Retsky MW, Swartzendruber DE, Bonadonna G. Proposal for a new model of breast cancer metastatic development. Ann Oncol 1997; 8: 1075–80. Baum M, Chaplain M, Anderson A, Douek M, Vaidya JS. Does breast cancer exist in a state of chaos? Eur J Cancer 1999; 35: 886–91. Folkman J, Watson K, Ingber D, Hanahan D. Induction of angiogenesis during the transition from hyperplasia to neoplasia. Nature 1989; 339:58–61. Folkman J. What is the evidence that tumors are angiogenesis dependent? [editorial]. J Natl Cancer Inst 1990; 82: 4–6. Douek M, Davidson T, Hall-Craggs MA et al. Contrast enhancement MRI and tumour angiogenesis in breast cancer. Br J Surg 1997; 84: 1588. Haran E, Maretzek A, Goldberg I, Horowitz A, Degani H. Tamoxifen enhances cell death in implanted MCF7 breast cancer by inhibiting endothelial growth. Cancer Res 1994;54: 5511–14. Baum M, Benson JR Current and future roles of adjuvant endocrine therapy in management of early carcinoma of the breast. In Senn HJ, Gelber RD, Goldhirsch A, Thurlimann B, eds. Recent Results in CancerResearch—Adjuvant Therapy of Breast Cancer. Heidelberg: Springer, 1996:215–226. Hackshaw, A. and E. Paul, Breast self-examination and death from breast cancer: a meta-analysis. Br J Cancer, 2003. 88: p. 1047-1053. Fisher B, The surgical dilemma in the Primary Therapy of Invasive Breast Cancer: A critical appraisal. Chicago: Year Book Publishers (current Problems in Surgery), 1970. Veronesi U, Saccozzi R, Del Vecchio M, et al Comparing radical mastectomy with quadrantectomy, axillary dissection, and radiotherapy in patients with small cancers of the breast. New England Journal of Medicine 1981; 305:6-11. Fisher B, Montague E, Redmond C et al, Comparison of radical mastectomy with alternative treatments for primary breast cancer. Cancer 1977; 39:2827-2839. Veronesi U, Luini A, Del Vecchio M, Greco M, Galimberti V, Merson M, et al. Radiotherapy after breast-preserving surgery in women with localized cancer of the breast. N Engl J Med 1993; 328(22): 1587-91. Fennessy M, Bates T, MacRae K, Riley D, Houghton J, Baum M. Late follow-up of a randomized trial of surgery plus tamoxifen versus tamoxifen alone in women aged over 70 years with operable breast cancer. Br J Surg. 2004 Jun;91(6):699-704. Vaidya JS, Baum M, Tobias JS, A new technique for Intra-operative radiotherapy after breast conserving surgery. Ann Oncol 2001;12:1075-80. Vaidya JS, Vyas JJ, Chinoy RF, et al. Multicentricity of breast cancer: whole-organ analysis and clinical implications. Br J Cancer 1996;74(5):820-4. Baum M, Vaidya JS, Mittra I. Multicentricity and recurrence of breast cancer. Lancet 1997;349(9046):208. Vaidya JS, Baum M, Tobias JS, D'Souza DP, Naidu SV, Morgan S, Metaxas M, Harte KJ, Sliski AP, Thomson E. Targeted intra-operative radiotherapy (Targit): an innovative method of treatment for early breast cancer. Ann Oncol. 2001 Aug;12(8):1075-80. PubMed PMID: 11583188. Vaidya JS, Baum M, Tobias JS, et al. The novel technique of delivering targeted intraoperative radiotherapy (Targit) for early breast cancer. Eur J Surg Oncol 2002;28(4):447-54. Vaidya JS, Wenz F, Bulsara M, Tobias JS, Joseph DJ, Keshtgar M, Flyger HL, Massarut S, Alvarado M, Saunders C, Eiermann W, Metaxas M, Sperk E, Sütterlin M, Brown D, Esserman L, Roncadin M, Thompson A, Dewar JA, Holtveg HM, Pigorsch S, Falzon M, Harris E, Matthews A, Brew-Graves C, Potyka I, Corica T, Williams NR, Baum M; TARGIT trialists' group. Risk-adapted targeted intraoperative radiotherapy versus whole-breast radiotherapy for breast cancer: 5-year results for local control and overall survival from the TARGIT-A randomised trial. Lancet. 2014 Feb 15;383(9917):603-13. doi: 10.1016/S0140-6736(13)61950-9. Epub 2013 Nov 11. PubMed PMID: 24224997. Clarke M, Collins R, Darby S, Davies C, Elphinstone P, Evans E, et al. Effects of radiotherapy and of differences in the extent of surgery for early breast cancer on local recurrence and 15-year survival: an overview of the randomised trials. Lancet 2005; 366:2087-106. Darby SC, Ewertz M, McGale P, Bennet AM, Blom-Goldman U, BrØnnum D, et al, Risk of Ischemic Heart disease in Women after Radiotherapy for Breast Cancer. N Engl J Med 2013; 368: 987-998. Nilsson G, Holmberg L, Garmo H, Terent A and Blomquist C. Increased incidence of stroke in women with breast cancer. European journal of Cancer 2005; 41: 423-429. Nilsson G, Holmberg L, Garmo H, Terent A and Blomquist C. Radiation to supraclavicular and internal mammary nodes in breast cancer increases the risk of stroke. British Journal of Cancer 2009; 100: 811-816. Voskoboynik M, Urban P, Mileshkin L. Early cardiovascular deaths in patients with cancer. N.Engl J Med 2012; 367:1572-3. 16. Belletti B, Vaidya JS, D'Andrea S, et al. Targeted intraoperative radiotherapy impairs the stimulation of breast cancer cell proliferation and invasion caused by surgical wounding. Clin Cancer Res 2008;14(5):1325-32. Beatson GT, On the treatment of inoperable cases of carcinoma of the mamma: Suggestions for a new method of treatment, with illustrative cases, Lancet 1896; ii:104–107. Patterson R, Russell MH. Clinical trials in malignant disease. Part II. Breast cancer: value of irradiation of the ovaries. Journal of the Faculty of Radiologists 1959; 10:130–145. Harper MJK, Walpole AL. Nature 1967; 212:000–000. Walpole AL. Journal of Reproduction and Fertility 1968; 3(Suppl 4): 000–000. Yates RA, Dowsett M, Fisher GV et al. Arimidex (ZD1033): a selective, potent inhibitor of aromatase in post-menopausal female volunteers. Br J Cancer 1996;73:543–548. Nicholson RJ, Finney EJ, Maynard PV. Activity of a new analogue of luteinising releasing hormone analogue, ICI 118,630, on the growth of rat mammary tumours. Journal of Endocrinology 1976; 79:51–52. Baum M, Brinkley DM, Dossett JA, et al. Controlled trial of tamoxifen as adjuvant agent in management of early breast cancer: Interim analysis at four years by the Nolvadex Adjuvant Trial Organization Lancet 1983; 5th Feb:257–261. Fisher B. The surgical dilemma in the primary therapy of invasive breast cancer: A critical appraisal. Chicago: Year book publishers (current problems in surgery) 1970. Bonadonna G. Brusamolino E, Valagussa P, et al. Combination chemotherapy as an adjuvant treatment in operable breast cancer. New England Journal of Medicine 1976; 294: 405-410. Adjuvant ovarian ablation versus CMF chemotherapy in premenopausal women with pathological stage II breast cancer: The Scottish trial Scottish Cancer Trials Breast Group and ICRF Breast Unit, Guy’s Hospital London, Lancet 1993; 341:1293–1298. Rose DP, Davis TE. Ovarian function in women receiving chemotherapy for breast cancer. Lancet 1977; ii:1174–1176. Effects of adjuvant tamoxifen and of cytotoxic therapy on mortality in early breast cancer. An overview of 61 randomized trials among 28 896 women. Early Breast Cancer Trialists’ Collaborative Group (EBCTG) New England Journal of Medicine 1988; 319:1681–1692. Fisher B, Dignam J, Bryant J, et al. Five versus more than five years of tamoxifen therapy for breast cancer patients with negative lymph nodes and estrogen receptor-positive tumors. J Natl Cancer Inst 1996;88:1529–42. The ATAC (‘Arimidex’, Tamoxifen, Alone or in Combination) Trial: Transvaginal ultrasound scan findings overestimate observed pathological findings in postmenopausal gynaecologically asymptomatic women before treatment. Jackson TL, Duffy SRG. Breast Cancer Res Treat 64 (Suppl 1), 64, Abs. 2000. Smith, I. E. and M. Dowsett (2003). "Aromatase inhibitors in breast cancer" N Engl J Med 348: 2413-244  Anastrozole alone or in combination with tamoxifen versus tamoxifen alone for adjuvant treatment of postmenopausal women with early breast cancer: first results of the ATAC randomised trial The ATAC Trialist’s Group Lancet 2002; 359:2131–39. Thurlimann B, Keshaviah A, Coates AS, et al. for the Breast International Group (BIG) 1-98 Collaborative Group. A comparison of letrozole and tamoxifen in postmenopausal women with early breast cancer. N Engl J Med 2005;353:2747–57. Schairer, C., P.J. Mink, L. Carroll, et al., Probabilities of death from breast cancer and other causes among female breast cancer patients. J Natl Cancer Inst, 2004. 96(17): p. 1311-21. Forrest P, Breast Cancer Screening Report to the Health Ministers of England, Wales, Scotland and Northern Ireland, 1986. U.S. Preventive Services Task Force. Screening for Breast Cancer: Recommendations and Rationale. Ann Intern Med 2002;137: 344-6. Baum M. Screening for breast cancer, time to think-and stop? Lancet 1995; 346: 436-437. Burton RC, Bell RJ, Thiagarajah G, Stevenson C. Adjuvant therapy, not mammographic screening, accounts for most of the observed breast cancer specific mortality reductions in Australian women since the national screening program began in 1991. Breast Cancer Res Treat. 2012; 131(3): 949-55. Independent UK Panel on Breast Cancer Screening. The benefits and harms of breast cancer screening: an independent review. Lancet 2012; 380:1778-86. Humphrey LL, Helfand M, Benjamin KS, Chan MS, Woolf SH. Breast Cancer Screening: A Summary of the Evidence for the US Preventive Services Task Force. Ann Intern Med. 2002;137:347-360. Nystrom L, Andersson I, Bjurstam N et al. Long-term effects of mammography screening: updated overview of the Swedish randomised trials. Lancet. 2002;359:909-19. Ole Olsen, Peter C. Gotzche. Cochrane review on screening for breast cancer with mammography. Lancet 2001; 358: 1340-42. Horton, Richard. Screening mammography – an overview revisited. Lancet 2001; 358: 1284-85. 5.Miller AB, To T, Baines CJ, Wall C. The Canadian National Breast Screening Study-1: Breast Cancer Mortality after 11 to 16 Years of Follow-up. Ann Intern Med. 2002;137:305-312. Rembold CM, Number needed to screen: development of a statistic for disease screening. BMJ 1998;317: 307-12. Skrabanek P. Mass mammography. The time for reappraisal. Int J Technol. Assess Health Care 1989; 5: 423-430. Bunker JP, Houghton J and Baum M; “Putting the risk of breast cancer in perspective”. BMJ, 1998; 317:1307–1309. Dixon-Woods M. Writing wrongs? An analysis of published discourses about the use of patient information leaflets. Soc Sci Med 2001; 52: 1417-1432. “Breast screening: the facts—or maybe not”, Gøtzsche PC et al. BMJ 2009, 338; 446-448. Mortality results from a randomized prostate screening trial. Andriole et al. NEJM 2009, 360: 1310-1319. Screening and prostate cancer mortality in a randomized European trial. Schroder et al. NEJM 2009, 360:1320-1328. Screening and choice: Informed choice for screening: implications for evaluation. Les Irwig, Kirsten McCaffery, Glenn Salkeld, Patrick Bossuyt: BMJ 2006;332:1148-1150. Rate of over-diagnosis of breast cancer 15 years after end of Malmö mammographic screening trial: follow up study. Zackrisson S, Andersson I, Manjer J and Garne JP, BMJ 2006;332:689-92. “Should I be tested for Cancer?” H Gilbert Welch. University of California Press, 2004, ISBN 0520239768. Incidence of breast cancer in Norway and Sweden during introduction of nationwide screening: prospective cohort study. Zahl PH, Strand BH, Maehlen J. BMJ. 2004 Apr 17;328(7445):921-4. “Randomised Clinical Trials: the patient`s point of view.” Hazel Thornton, in Ductal Carcinoma in Situ of the Breast. Ed. Melvin Silverstein. Williams and Wilkins 1997. Insurance repercussions of mammographic screening: What do women think? Claire Davey, Victoria White, Jenette E. Ward. Medical Science Monitor 2003; 8:LE44-45. Effect of mammographic screening from age 40 years on breast cancer mortality at 10 years’ follow up: a randomised controlled trial. Moss SM, Cuckle H, Evans A, Johns L, Waller M, Bobrow L, The Lancet 2006, 368; 2053-2060. Prevention of Breast Cancer in Postmenopausal Women: Approaches to Estimating and Reducing Risk: Steven R. Cummings, Jeffrey A. Tice, Scott Bauer, Warren S. Browne, Jack Cuzick et al; J Natl Cancer Inst 2009;101: 384 – 398. May J, Baum M, Bewley S, Plato’s Socratic dialogues and the epistemology of modern medicine. J Royal Soc Med 2010; 103: 484-489. Baum M, Harms from breast cancer screening outweigh benefits if death caused by treatment is included. BMJ 2013; 346: 27. Bleyer A, Welch HG, Effect of three decades of screening mammography on breast-cancer incidence. N Eng J Med 2012;367: 1998-2005. Gøtzsche PC, Nielsen M. Screening for breast cancer with mammography. Cochrane Database Syst Rev 2011;(1):CD001877.